The first of Blackpool’s international ‘resident’ artists has moved into Abingdon Studios, above the market. Blackpool’s newest contemporary art studio space was recently acknowledged as ‘best venue’ in the Guardian’s insider’s guide to the town - long a magnet for artists. In all, 66 artists from across the UK and Europe expressed interest in taking up to one month residencies in the resort. 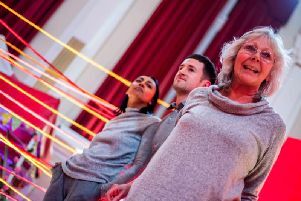 The project, called Work/Leisure, proves that a change can be as good as a rest for artists developing their careers in very different towns and cities - and leaping at the chance to explore the culturally unique nature of Blackpool. It gives visiting artists, from as far afield as Canada and Berlin, the chance to work alongside the six resident Fylde coast artists already based in Abingdon Studios. It’s being co-ordinated by Tom Ireland of Supercollider Contemporary Art Projects and financially supported by Arts Council England. Five artists are making the studios their base - inspired by the richness of the Blackpool landscape. The first, Benjamin Orlow, from London, has already arrived to set up. Others include Ralph Dorey and John Lawrence, both of London, and two Berliners Koennamann and Katharina Ludwig. A sixth artist, sound artist Adam Bassanta, from Canada, also arrived this week as part of the partnership with Blackpool’s Other Worlds Festival - an international festival of experimental music and sound taking place in April. Adam is working on an exhibition which will run at the studios from April 7-10 during the festival.